You can help keep struggling families from being taxed into poverty. 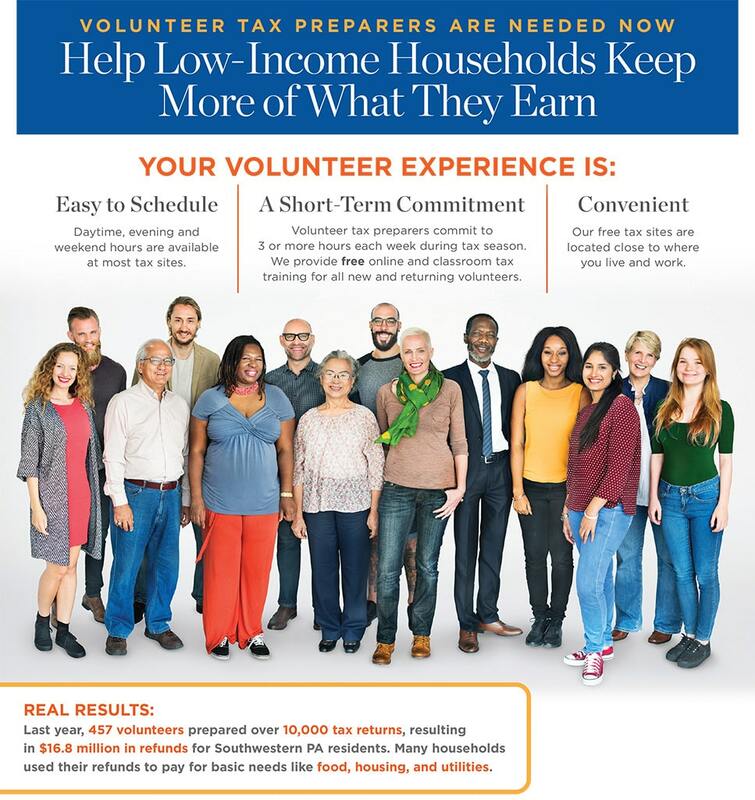 Volunteer at one of our Free Tax Prep program sites! For 15 years, our tax sites have helped thousands of low-income households in Allegheny County to maximize their tax refund without paying any hefty prep fees from commercial agencies. 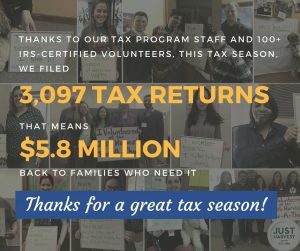 In 2017, Just Harvest’s free tax return preparation program put more than $6 million dollars back into the pockets of nearly 3,000 working people in Allegheny County. Having this program reach as many people as possible is more important than ever. Republican leaders in D.C. are about to try to pass “tax reform” that could lock in this country’s wealth inequality. Those at the bottom will stay stuck at the bottom if tax relief gets even harder to come by. 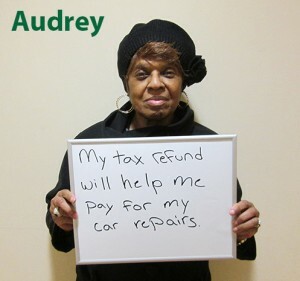 Whatever happens nationally, your participation in our free tax filing program will help. 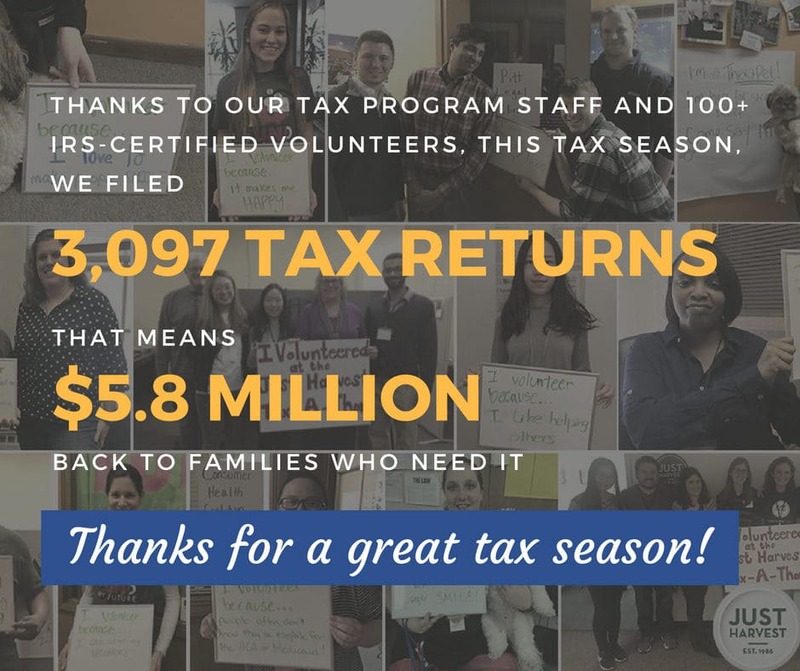 Our volunteers ensure that low-income people in Allegheny County can access existing tax credits and keep as much of their hard-earned dollars as possible. This free program literally can’t happen without folks like you. You can help make the 2018 tax season another HUGE success. Become a client greeter or tax preparer at one of our four free tax prep sites. No experience required! Find out more about the positions and how you can sign up! Assistance in filing your 2018 taxes will be provided January 22 – April 15. Tax appointment scheduling has begun! Walk-ins for tax filing assistance are not permitted, so please schedule an appointment at one of Just Harvest's four tax sites. View the How to Get Help section on this page for tax site and scheduling information. Click to see more of our clients and read their stories. To find out if you are qualified to receive the EITC, use the online EITC Assistant to estimate the amount of credit you are entitled to claim. Or contact us and get free help preparing your EITC tax return! Visit www.irs.gov/eitc to learn more about the EITC. partnered with PA 2-1-1 Southwest to answer 101,700 requests for free tax help (from 2011-2018).